Upstate Republican State Senator John A. DeFrancisco sponsored the bill, which would create a Commission on Prosecutorial Conduct. Many criminal justice reform advocates support the bill, stating that it would help prevent wrongful convictions and would hold prosecutors accountable for their misconduct. Alternatively, opponents say it will have a chilling effect on prosecutors’ work and cause them to be unnecessarily defensive in carrying out their duties. On August 21, 2018, Governor Cuomo signed the bill. Justifying his decision, Governor Cuomo explained that the commission would be a much-needed tool to root out any potential abuses of power, as well as keep the justice system fair for all New Yorkers. However, he did not sign with full approval. He agreed to sign with the caveat that the Legislature would amend the bill to address his concerns about its constitutionality during the next legislative session. In effect, the bill would create a first-of-its-kind commission to investigate prosecutors who violate the standards of their office. There are none others like it in the nation and it would likely serve as a model for other states to follow suit. Logistically, the bill proposes a watchdog commission made up of eleven members. These members will be prosecutors, defense attorneys, and judges. Six will be appointed by the Legislature, two will be appointed by the governor, and three will be appointed by the chief judge of the Court of Appeals, New York’s highest court. The commission is charged with investigating any allegations of prosecutorial misconduct against any district attorneys in New York. It would have the resources to investigate any accusation of unethical, unprofessional, or unlawful action. Some of its power includes the ability to conduct hearings, compel witnesses to testify, issue subpoenas, and request records or materials for the investigation. Also, it would have broad power to punish prosecutors for misconduct, including through suspension and removal from office. On Wednesday, October 17, 2018, prosecutors filed a 27-page complaint naming New York State, Governor Cuomo, state legislative leaders, and the commission as defendants in the suit. The plaintiffs are a group of District Attorneys from New York led by Albany County District Attorney David Soares. Primarily, the plaintiffs argue that the bill makes significant changes by statute that can only be made by changing the state’s constitution. Therefore, it is unconstitutional, and the commission should not be formed. However, the plaintiffs make arguments beyond constitutional issues, saying that the bill will practically hurt their job performance. They express concern that their independence will be threatened and that they will be hindered from carrying out their duties. Also, they predict that the interference in their work will breed more public corruption and distrust of public officials. Central to the suit are several claims that the commission violates both the New York State Constitution and United States Constitution. First, the plaintiffs argue that the Legislature would be meddling in the affairs of district attorneys, who are elected executive-branch officials, therefore violating the doctrine of separation of powers. Additionally, they point out that there were no standards put forward for how the commission would determine who can and cannot be investigated. This violates the rights of the prosecutors under the Constitution’s Due Process and Equal Protection clauses. Finally, it would impermissibly expand the powers of the Court of Appeals. The New York Constitution limits the duties of judges to functions that are “reasonably incidental” to the fulfillment of judicial duties. This suit argues that judges sitting on this commission would go beyond “reasonably incidental duties” and therefore be acting unconstitutionally. Governor Cuomo recognized some of these shortcomings when he signed the bill. He noted that there could be issues with separation of powers and the limited role of the judiciary. However, his office showed the most concern over the fact that the commission’s findings would be sent to the governor and available to the public. This could open the door for people to meddle in criminal cases and even active investigations. The concern is that anyone intent on disrupting a case can abuse the commission by forcing public disclosure of a prosecutor’s files. After the lawsuit was filed, Governor Cuomo’s counsel outlined some major changes that will be made to the bill. One major change is a shift in the selection process of the eleven members of the commission. The governor and the legislature will each select four members, and the judiciary would still pick three, but its appointees must be retired judges. Another significant change is that the commission’s findings will be issued through the appellate courts, not the Court of Appeals. This shift is an effort to limit the power gained by the Court of Appeals. Finally, the amended bill made an important change regarding the timing of investigations into prosecutorial misconduct. The bill will prevent the commission from investigating District Attorneys during current investigations or ongoing cases where no charges have been filed. The amended bill is set to take effect in January, but its future is uncertain pending the outcome of this lawsuit. Amanda Ottaway & Adam Klasfeld, NY Prosecutors Sue to Stop Misconduct Watchdog, Courthouse News Service (October 17, 2018). Corinne Ramey, In Lawsuit, New York State Prosecutors Call Oversight Commission Unconstitutional, Wall Street Journal (October 17, 2018). David Klepper, Capitol Watch: Local Prosecutors Sue Over Misconduct Panel, U.S. News (October 20, 2018). Jesse McKinley, A New Panel Can Investigate Prosecutors. They Plan to Sue to Block It., New York Times (August 23, 2018). Jonathan Bandler, NY Attorney General questions constitutionality of oversight commission for prosecutors, Lohud (August 14, 2018). Ryan Boysen, NY Das Sue Cuomo Over Prosecutorial Misconduct Law, Law 360 (October 18, 2018). Photo courtesy of Utah Bar Association. While the law school experience has always been critical to our training as both strong client advocates and skilled legal technicians, it often undercuts or discounts the very reason that many of us were first drawn to the profession – service. Service to our clients, service to the community, service to our profession. For 1985 alumnus Tom Zampino, that initial attraction to service was only reinforced in his first year by property law professor, Sam Fetters. Tom still remembers Professor Fetters’ exhortations that lawyers are an integral part of a much larger community. Professor Fetters reiterated for students to remain mindful of the out-sized power and influence lawyers exert within it and over others. The law, after all, affects nearly every aspect of our lives every single day. 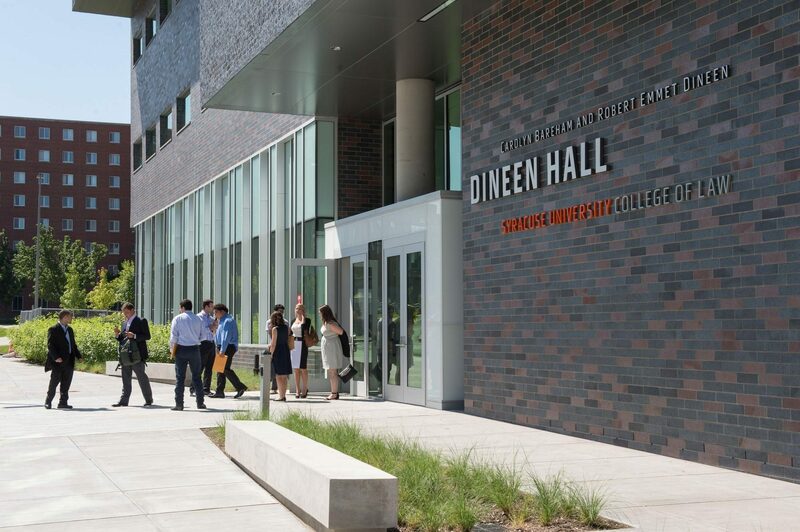 Before starting Syracuse Law in 1982, this Long Island native, attended SUNY at Stony Brook, majoring in political science and minoring in business administration. During his junior year at Stony Brook, Tom’s business law class, taught by adjunct Professor Elliot Kleinman, rekindled his strong and early interest in the law. He later served as an intern at Kleinman’s general practice law firm for a number of months, all but cementing his love of the profession. law schools, mostly so that he could save some money and fully prepare for the LSAT. It paid off. Syracuse University awarded Tom a Graduate Fellowship, allowing him to attend the law school for two years completely tuition free. It also supplied a modest living stipend during those two years. Tom remains grateful to Syracuse University because, without that Graduate Fellowship and stipend, he likely would never have been able to afford those three years. Like most law students, Tom had no idea of the type of law that he wanted to practice. Like many of his fellow classmates, he was excited to hear Professor Peter Bell talking about the then-starting salaries of New York City, big-firm associates. He immediately began to plan his strategy to look for a job back home. But before heading back home, Tom first had to plan for his 1L summer. Syracuse’s Law in London Program seemed ideal and he signed up for this seven-week, international legal adventure. While in London, Tom first worked with solicitors at the Greater London Council (GLC), which at that time was part of London’s municipal governing structure. He later interned with prestigious Queens Counsel barristers, regularly attending court and observing the lawyers and judges sparring in full legal regalia, wigs and all. The Law in London program gave Tom a broad overview of the current British and early American legal system. But perhaps his fondest memory there was meeting with actor Raymond Burr, who was then starring in a local production. Tom and several of his classmates waited patiently by the stage door and, much to their delight, Mr. Perry Mason himself spent a good long time speaking with these impressionable American law students. Perhaps no one had had a greater and earlier influence over Tom’s choice of a legal career than did the fictional Perry Mason. The circle was now complete. (and self-taught) there have proved invaluable. It’s an experience that Tom looks back on with a sense of accomplishment. Tom’s 2L summer was spent in NYC working for a mid-sized, Park Avenue firm as a summer associate for Reavis & McGrath, which today, after several mergers, is known as Norton Rose Fulbright. At the end of that summer, Reavis & McGrath offered him a full-time position upon graduation. He immediately accepted. After graduating from Syracuse with honors in 1985 and passing the NYS bar, Tom worked at Reavis & McGrath for the next 20 or so months, concentrating in corporate and securities law. Because his wife Rachel had then gotten into Harvard Law School, they together re-settled in Boston for what turned out to be the next six years. Of course, that meant that Tom had to take another bar exam, but one that he found, relatively and gratefully, to be just a bit easier than the NYS bar. In Boston, Tom first worked at Goodwin Proctor & Hoar, now just “Goodwin,” in its corporate and healthcare departments. After two years there and seeking a change, Tom noticed an opening on the legal staff of the Massachusetts State Ethics Commission. He was offered and immediately accepted that position where he then worked for the next four years drafting and defending government employee ethics opinions. He served for a time as both Acting General Counsel and Deputy General Counsel. 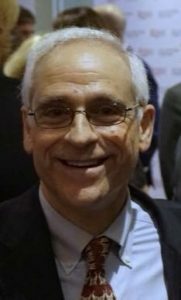 The most significant Ethics Commission case that Tom defended in court concerned the applicability of the Commission’s authority over employees of the Massachusetts Bay Transportation Authority (MBTA), a matter that was quickly taken up by the Massachusetts Supreme Judicial Court because of its broad and highly publicized impact. Tom’s first and only outing before that august body remains today a highlight of his legal career, having withstood a very hot bench and walking away unscathed. While the Court ultimately ruled against the Commission’s assertion of authority over MBTA employees, the Court did adopt most of the jurisdictional test that Tom himself had crafted from other government sources and then argued should apply in the case before it. Before leaving the Commission, Tom published a book on its practices and procedures. After six years in Massachusetts, family concerns were calling him back to New York. Not wanting to return to the big firm, corporate life, Tom reached out to a small boutique firm that specialized in NYC real estate taxes, Podell, Schwartz, Schechter & Banfield. He spent the next 24 years there, the last ten as a partner. A brief stint as a (losing) candidate for the NYS Assembly rounded out his years there. In 2017, an exciting opportunity opened that allowed him to step back into big firm life but still practice in the small, highly defined specialty that he has grown to love. As Special Counsel at Stroock & Stroock & Lavan LLP, located near Wall Street, Tom gets to work with some extraordinary colleagues across multiple disciplines and to represent many top notch, sophisticated, super-premier clients. He now has the best of both worlds. Tom’s legal training has held him in good stead throughout the years. While his practice mostly involves the world of numbers rather than of words, he stills largely credits Law Review with his love of writing; something to which he has devoted more and more time as he now explores the delights of writing poetry (perhaps one day to be published). His advice to law students? Remembering what Sam Fetters admonished his class all those years ago: always be mindful of the influence that we, as lawyers, exert over others. It is a great opportunity but an even greater responsibility. And keep in mind that we are a service industry. 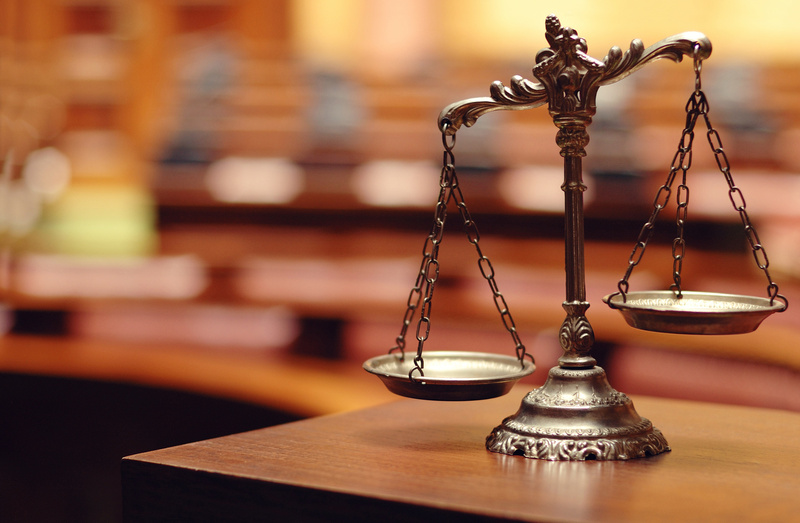 We are here to zealously serve both our clients and the legal community. But know that we are always at our most effective when we treat each other – colleagues, clients, and adversaries – with respect, dignity, and civility at all times and in every encounter. This story was written by Alumni Editor Stefani Joslin and is the twelfth installment of Syracuse Law Review’s new monthly feature, “Alum of the Month.” Stay tuned for next month’s feature on another noteworthy Syracuse Law Review alumnus. On October 2, 2018, a Saudi journalist entered the Saudi Arabian consulate in Istanbul, Turkey, but he has been missing since that day. 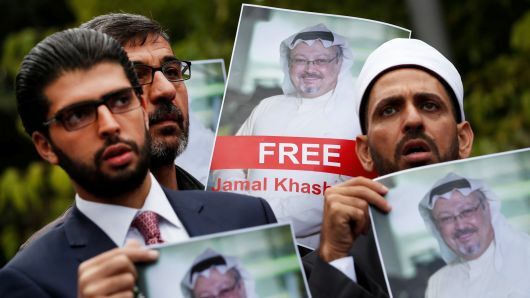 Jamal Khashoggi’s disappearance remains unexplained, but as investigations continue, it appears increasingly likely that the notable Saudi journalist met a far more tragic end. At this time, it cannot be confirmed whether Khashoggi was kidnapped, tortured, or executed inside the Saudi embassy, but as each day passes and Khashoggi remains missing, those theories grow more plausible. As the world seeks answers about the mysterious disappearance, world leaders face difficult legal and diplomatic decisions. Jamal Khashoggi, 59, was more than a prominent Saudi journalist. He also served as a former adviser to top Saudi officials earlier in his career before becoming a journalist. In his column, Khashoggi praised Crown Prince Mohammed bin Salman’s reforms which permitted women to drive and enter the workforce. However, he also frequently criticized bin Salman’s restrictions on freedom of expression by drawing attention to the imprisonment of intellectuals and journalists which became commonplace. Fearing retaliation for his writing, Khashoggi has lived in self-imposed exile in Washington, D.C. for the last year, where he continued to criticize bin Salman in a Washington Post column. At 1 p.m. on October 2, 2018, Khashoggi, a Saudi citizen, entered the Saudi consulate in Istanbul to obtain documents to marry his Turkish fiancé, Hatice Cengiz. Prior to entering the consulate, Khashoggi gave her two cell phones, instructing her to call an adviser of Turkish President Erdogan if he did not emerge. The meeting was not expected to take more than an hour, but Cengiz waited for Khashoggi outside the embassy for ten hours. He never returned. At this time, the only verified fact is that Khashoggi entered the Saudi embassy and has not yet emerged. Saudi officials, including Crown Prince Mohammed bin Salman, have vehemently denied the accusations and insist that Khashoggi left the consulate shortly after he arrived. However, they have not produced evidence proving that Khashoggi ever exited the consulate. In the days following Khashoggi’s disappearance, his fiancé wrote a letter to President Donald J. Trump imploring him to investigate. At the time this is being written, President Trump has refrained from accusing Saudi Arabia of any wrongdoing because concrete evidence has not yet been released verifying Khashoggi’s fate. But as details have emerged from Turkish authorities, U.S. lawmakers have called for action following Saudi Arabia’s most recent attempt to silence such a prominent dissident. As a result, a bipartisan group of 22 U.S. Senators invoked the Global Magnitsky Act of 2016, triggering a human rights probe into the case of Khashoggi’s disappearance. The Global Magnitsky Act does not require the Trump Administration to levy sanction against Saudi Arabia even if they are found responsible for the disappearance of Khashoggi. However, the Act does require the Administration to decide within four months whether to impose financial or travel-related sanctions against the individuals responsible. Ultimately, the power granted to the President under this Act is discretionary. President Trump has the authority to levy sanctions against any foreign person responsible for, complicit in, or otherwise shown to have directly or indirectly engaged in “serious human rights abuse.” The sanctions may be enforced against government officials or any individuals acting on their behalf if shown to be directly or indirectly engaged in serious human rights abuse. Under this Act, President Trump has the authority to levy individual financial and travel-related sanctions against Crown Prince bin Salam. Implementing sanctions of that magnitude on Saudi officials would undoubtedly strain relations with the powerful and prosperous ally which have been revitalized under President Trump. Saudi Arabia’s inability to provide concrete evidence proving Khashoggi exited the consulate threatens Saudi Arabia’s reputation throughout the international community. International leaders from the United Kingdom, France, Germany, and Russia have voiced their concern about the allegations and implore Turkey and Saudi Arabia to conduct credible investigations uncovering the truth. Like President Trump, international leaders of these countries are hesitant to condemn the Saudi government until credible investigations have been conducted. To ensure credible investigations, several human rights organizations have urged Turkey to request a timely and transparent United Nations investigation to prevent political biases from affecting the investigations. Responsibility for Khashoggi’s disappearance would be a stain on a nation that has otherwise appeared to attempt reform, perhaps illustrating some truth to Khashoggi’s criticisms. The Global Magnitsky Act was enacted to investigate and impose sanctions upon individuals who commit serious human rights violations. By invoking the Act in this investigation, Congress has given President Trump four months to decide whether to impose sanctions if foul-play occurred. As facts are uncovered in the coming weeks, President Trump’s foreign policy will be in the international spotlight. Anna Edgerton, Bipartisan Senate Group Forces U.S. Probe of Saudi Journalist’s Disappearance, TIME, (Oct. 11, 2018). Deirde Sesgreen & Kim Hjelmgaard, What we know (and don’t) about missing Saudi journalist Jamal Khashoggi, USA Today, (Oct. 11, 2018). Executive Order No. 13,818, 82 Fed. Reg. 60,839, 60,839–60,840 (Dec. 20, 2017). Jamal Khashoggi case: All the latest updates, AL JAZEERA (last updated Oct. 14, 2018). Jordan Tama, What is the Global Magnitsky Act, and why are U.S. senators invoking this on Saudi Arabia, WASH. POST, (Oct. 12, 2018). Ola Salem, What is the Magnitsky Act? How does it apply to Khashoggi’s case?, AL JAZEERA, (Oct. 11, 2018). Orhan Coskun, Sarah Dadouch, & Stephen Kalin, An Apple Watch, hired jet, mystery vehicle could provide clues in the search for missing Saudi journalist Jamal Khashoggi, BUSINESS INSIDER, (Oct. 10, 2018). Rob Bershinski, An Explainer: Senate’s Letter on Khashoggi and the Global Magnitsky Act, JUST SECURITY, (Oct. 12, 2018). Chicago Jury Convicted Jason Van Dyke of Second-Degree Murder: Could it be Overturned on Improper Venue Grounds? On October 5, 2018, a Chicago jury convicted former police officer Jason Van Dyke of second-degree murder for the fatal shooting of Laquan McDonald in 2014. However, the legal battle surrounding McDonald’s death is far from over, as Van Dyke’s lawyers intend to appeal his conviction. The issue of venue is likely to be appealed in this case. On October 20, 2014, police officers received a report that someone with a knife was breaking into cars in a parking lot near South Pulaski Road and 41st Street in Chicago, Illinois. Officers pursued 17-year-old Laquan McDonald, who was seen in the location. McDonald allegedly refused to stop when officers ordered him to do so. Officer Van Dyke arrived on the scene, and, within six seconds of his arrival, repeatedly shot McDonald, continuing to shoot after he fell to the ground. Autopsy reports revealed that McDonald was shot sixteen times. On November 24, 2015, just over a year after the shooting, Van Dyke was charged with first degree murder for killing McDonald in Cook County. On August 3, 2018, Van Dyke’s defense attorney moved for the trial to be held outside of Cook County, arguing that Van Dyke would be unlikely to receive a fair trial because of intense publicity that had surrounded the case. He presented the results of a study by a defense expert indicating that a majority of those polled believed Van Dyke was guilty. The judge delayed ruling on the motion until after jury selection. The trial took place over four weeks, with jury selection beginning on September 10, 2018. Over the course of two and a half days, 54 potential jurors were questioned. Testimony began on September 17. The prosecution presented its case over four days, and the defense presented its case over five days. Closing arguments took place on October 4, and the jury deliberated from October 4 to October 5. On October 5, the jury returned a verdict, finding Van Dyke guilty of second-degree murder and sixteen counts of aggravated battery with a firearm, and not guilty of official misconduct. Van Dyke is scheduled to return to court on October 31 for a hearing, during which his attorneys will file post-trial motions and the date for his sentencing will be set. His attorneys have indicated that they intend to appeal his convictions. Given the pre-trial discussions of venue, it is likely that Van Dyke’s attorneys will appeal the judge’s ruling on venue. In Illinois, criminal prosecutions take place in the county where the crime was committed. A defendant may move to change the venue if “there exists in the county in which the charge is pending such prejudice against him on the part of the inhabitants that he cannot receive a fair trial in such county.” On appeal, a court’s decision to deny a motion for a change of venue will be upheld unless there is an abuse of discretion. When making this determination, appellate courts determine whether the defendant received a “fair and impartial trial” despite any potential for prejudice. Illinois appellate courts consider many factors when determining whether a defendant faced undue prejudice in a particular county. 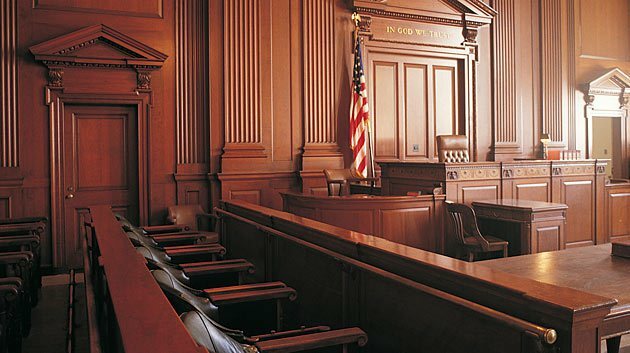 These factors include the pretrial publicity, specifically the amount of publicity surrounding the case, the time that passed between pre-trial publicity and the start of trial, and the inflammatory nature of any publicity. Given the nature of today’s media, it is difficult to find jurors that have never heard of high-profile cases. It is important to consider other factors in addition to publicity when determining if the defendant received a fair trial. Appellate courts will also review the selected jurors and the nature of the jury selection. A conviction is unlikely to be reversed based on venue if the jurors unequivocally indicated that they would remain unbiased despite any prior knowledge of the case. Illinois courts have also considered whether the defendant used all of his peremptory challenges. In a similar case involving a murder charge, the court upheld a conviction because the defendant did not exhaust his peremptory challenges. Van Dyke’s lawyers argued that it was impossible for Van Dyke to receive a fair trial in Cook County. After the release of the officer camera video, the trial received a great deal of publicity both within the city, and throughout the country. Further, a defense expert polled potential jurors and found that 74% percent of people polled believe that Van Dyke was guilty. Prosecutors for the state argued the defense’s study was skewed and offered its own study, indicating that 3.4 million people in the county could serve as unbiased jurors. Additionally, Van Dyke’s attorneys only used five of their peremptory challenges during jury selection, so there were no jurors selected after exhausting peremptory challenges. The appellate court will have to perform a careful balancing test when determining whether Van Dyke received a fair trial. Given that the defense did not use all of its peremptory challenges, and that jurors indicated that they would remain impartial and listen to the trial evidence, the state will have a strong argument on appeal. However, the defense will likely argue that the type of publicity surrounding this trial is much more prejudicial than past publicity. Several Illinois cases upheld murder convictions in rural towns after local newspapers and media stations covered the trials. Van Dyke’s attorneys will likely distinguish the scope and nature of this case’s publicity from those earlier cases. While it will likely be some time before an appellate court rules on Van Dyke’s appeal, the issue of venue will be a determining factor in whether Van Dyke’s conviction is upheld. Andy Grimm, Here are the critical legal questions looming now for Officer Jason Van Dyke, Chi. Sun Times (October 5, 2018). Judge Delays Ruling on Location of Laquan McDonald Murder Trial, CBS Chi. (August 3, 2018). Laquan McDonald: A Timline of the Shooting, Fallout, And Officer Van Dyke’s Trial, CBS Chi., (September 4, 2018). Mitch Smith, ‘We Just Didn’t Buy It’: Jury Was Unswayed by Officer’s Story in Laquan McDonald Case, N.Y Times (October 6, 2018). Mitch Smith, Timothy Williams, & Monica Davey, Jason Van Dyke Killed Laquan McDonald in 2014. Now Chicago Awaits a Verdict, N.Y. Times (October 4, 2018). People v. Friday, 598 N.E.2d 302 (1992). People v. Grover, 417 N.E.2d 1093 (1981). What You Need to Know About the Jason Van Dyke Trial, NBC Chi. (October 4, 2018). 720 Ill. Comp. Stat. Ann. 5 / 1-6 (West 2013). 725 Ill. Comp. Stat. Ann. 5 / 114-6 (West 1982). On September 24, 2018, the United States Court of Appeals for the Sixth Circuit reversed a District Court order that required the Tennessee Valley Authority to remove deposits of coal ash from one of its power plants, finding that the Clean Water Act does not apply to pollutants that reach protected waters via “hydrologically connected” groundwater channels. Tennessee Valley Authority (“TVA”) is an electricity provider for approximately 565,000 households in the Nashville, Tennessee region. The company runs several coal-fired plants, one of which is located along a part of the Cumberland River called Old Hickory Lake, a reservoir and recreational destination for millions of people each year. At its plants, TVA produces waste byproducts known as coal combustion residuals (“CCRs”). CCRs contain carcinogens such as arsenic. The CCRs are treated through a process known as “sluicing”, in which water is mixed with coal ash and allowed to settle in on-site ponds. TVA treats its CCRs at a series of unlined ponds known as the Complex. The Complex is located on a karst terrain adjacent to the Cumberland River under which sinkholes, fissures and caves create conduits through which groundwater easily flows. These nooks and crannies allow CCRs from the Complex’s unlined ponds to leak into groundwater that flows through the karst terrain and into the Cumberland River. Pursuant to effluent limitations and other protocols established by the CWA, the Environmental Protection Agency issued a permit to TVA that allows the company to discharge not all, but some of its “sluiced” coal combustion wastewater directly into the Cumberland River via a pipe called Outfall 001. The plaintiffs, two conservation groups from Tennessee who enjoy Old Hickory Lake as a recreational destination, filed suit on April 14, 2015. They did not contend with TVA’s permitted CCR direct discharge through Outfall 001, but rather argued that the company was in violation of the CWA because of CCR leaks entering Old Hickory Lake via “hydrologically connected” groundwater channels originating from the Complex’s coal ash ponds. The plaintiffs argued that the meaning of the statute encompassed pollutants entering the waterway through “hydrogically connected” channels, arguing that because the pollutants entered the river through leaks in the lined ponds, the ponds should be considered a point source. TVA argued that the meaning of point-source was limited to direct discharges, like those of Outfall 00, and that the statute did not mean to include the migration of pollutants through groundwater. 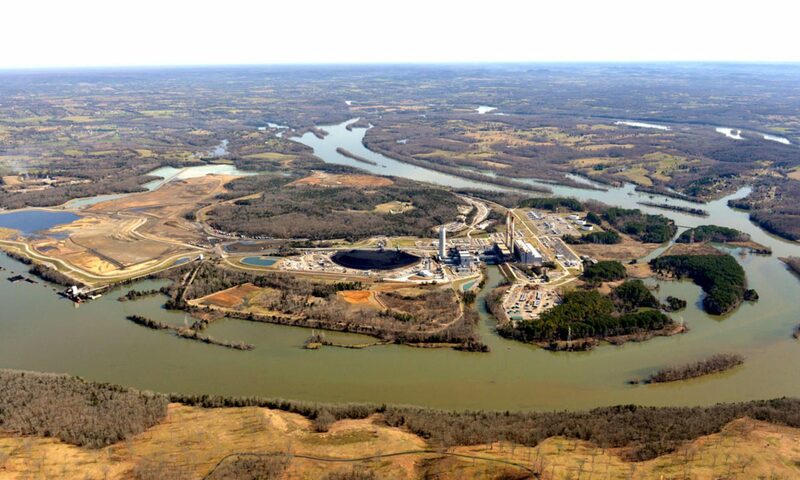 The District Court for the Middle District of Tennessee found for the plaintiffs and ordered TVA to excavate the coal ash in the Complex and remove it to a lined facility. The Court of Appeals for the Sixth Circuit reversed the District Court’s decision, finding that a pollutant must be placed directly into a protected water through a specific and identifiable point source. The court focused on the language of the statute regarding “discernible, confined and concrete conveyance(s).” It found that groundwater does not constitute a nonpoint-source conveyance and that karst-related leaks did not violate the provisions of TVA’s permit. The Court further stated that any regulation of pollutants through nonpoint-source conveyances does not come under the purview of the CWA. The dissent argued that the law could be easily circumvented as defined by the majority. The contention is that if the statute of the language meant that pollutants must come from a direct point source, then companies could circumvent the law simply by arbitrarily moving their drainage pipes a few feet away from the water so that they are not feeding “directly” into it. While the Court ultimately recognized that the pollution presented a significant environmental issue, it opined that the Clean Water Act was not the proper tool to address the problem. However, both the Fourth District and the Ninth District have ruled to the contrary in recent decisions, finding that an intermediary like groundwater does not necessarily defeat liability. These differences in opinion raise the question of whether a case like this might soon end up at the Supreme Court of the United States. Arsenic, Nat’l Inst. of Envtl. Health Scis. (last visited Sep. 30, 2018). Coal Ash Basics, U.S. Envtl. Prot. Agency (last visited Sep. 30, 2018). History of the Clean Water Act, U.S. Envtl. Prot. Agency (last visited Sep. 30, 2018). Kenneth Hall, Federal Appeals Court Overturns Tennessee Coal Ash Cleanup Order, JURIST, (last visited Sep. 30, 2018). Old Hickory Lake, US Army Corps of Eng’rs, (last visited Sep. 30, 2018). Tenn. Clean Water Network v. TVA, No. 17-6155, 2018 U.S. App. LEXIS 27237 (6th Cir. Sep. 24, 2018). Photo courtesy of Southern Environmental Law Center.